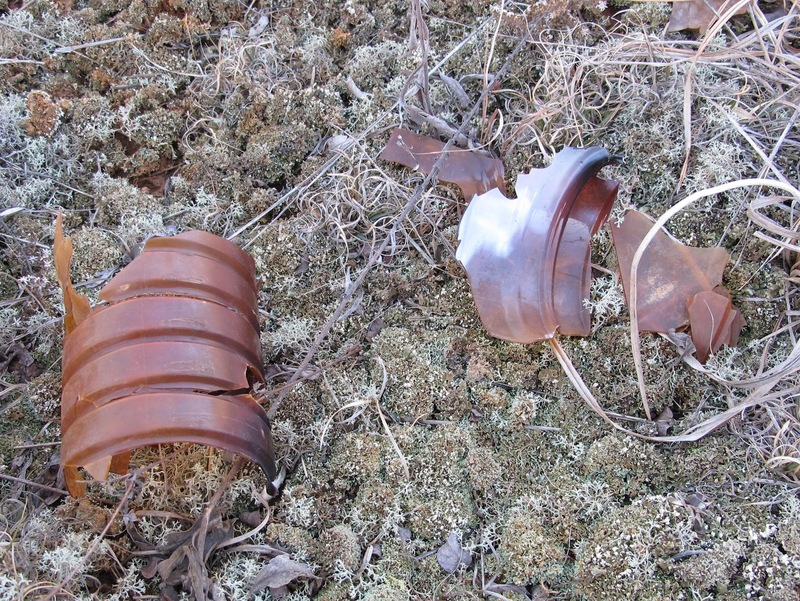 The dogs have been back pulling their favorite toys from the youngest of the Blue Jay Barrens archaeological sites. I usually just gather up their litter and put it back near the edge of the junk pile. I finally got tired of picking up the same items each month, so I took a paper feed sack back to gather up those pieces that are continually relocated. 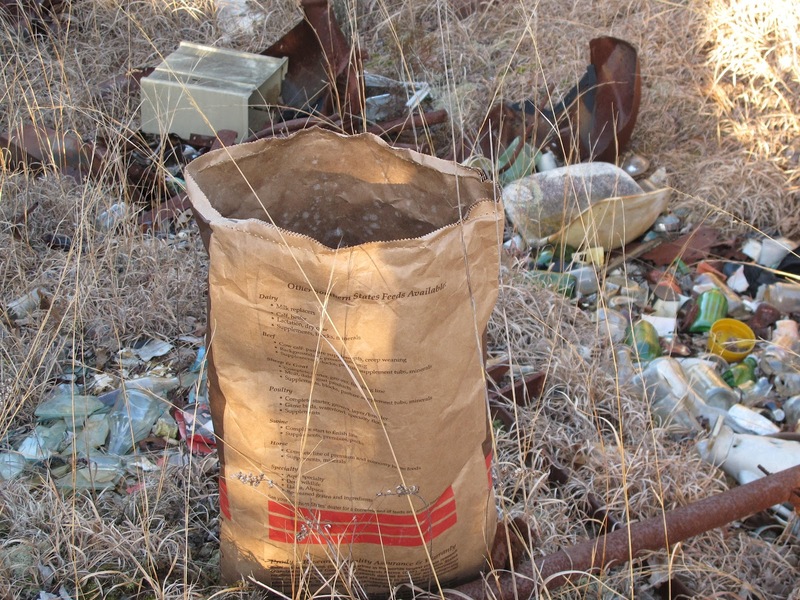 I just can’t understand why those stray dogs put so much effort into dragging this stuff around. This seems to be the dog’s all time favorite bit of debris. 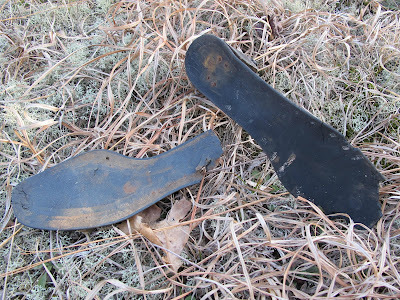 I’ve found the shoe as far as 200 feet from the pile. The last dog managed to make two pieces out of it. 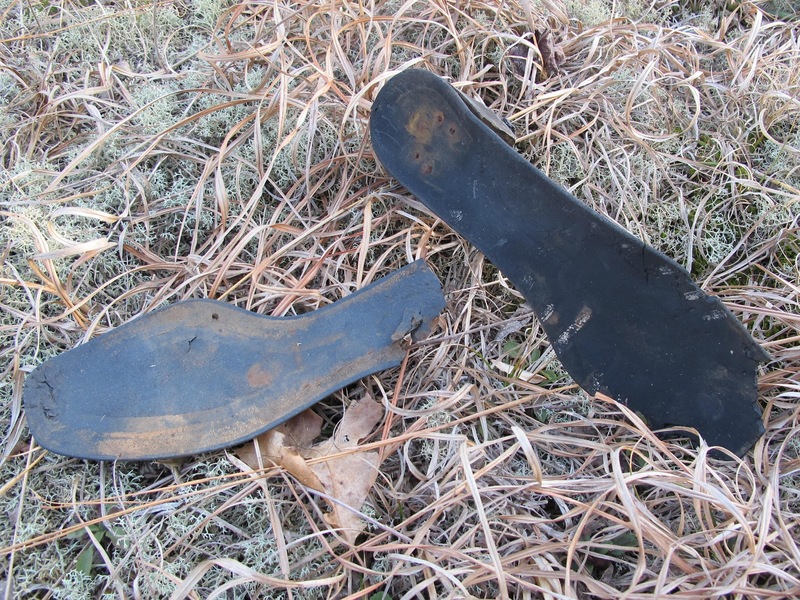 There are several fresh doggie tooth marks in the heel. This must be a good tasting piece of plastic. Plastic bottles are another favorite. Most of the plastic has turned brittle over the years. 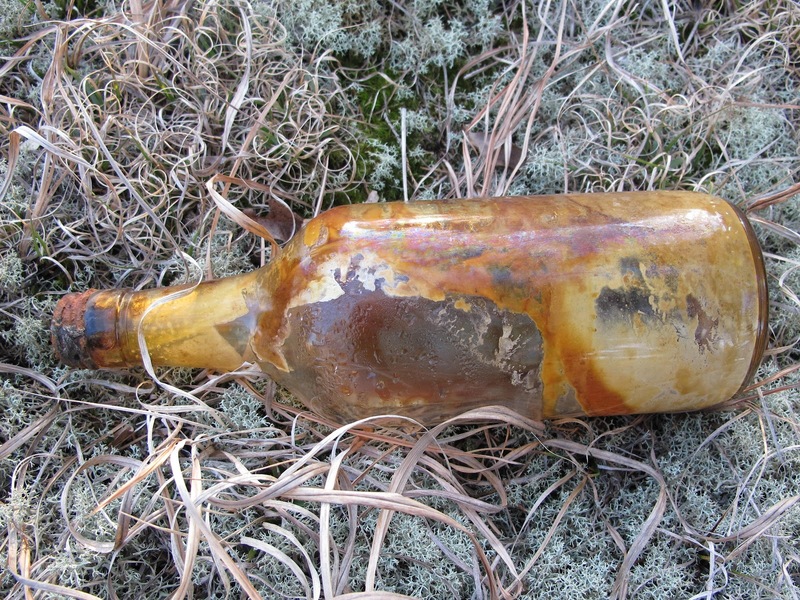 The dogs chew the bottles into small bits that can be aggravating to collect. 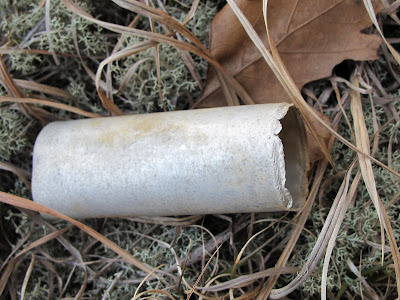 This aluminum casing from an old radio tube was carried away, but not chewed. A previous owner of this property worked in a TV and Radio repair shop. He regularly brought home old TV sets and radio chassis. Some of this stuff was dumped over the hill and the rest was left sitting around the barn yard. The dogs couldn’t get the cap off of this whiskey bottle. It doesn’t look like the contents are all that appetizing. I used to have a dog that could have chewed up this bottle and eaten the broken glass. He was like the old stereotype goat that would eat tin cans. His droppings used to sparkle in the sunlight. Raised letters warn that “Federal law forbids sale or reuse of this bottle”. That warning was required on liquor bottles from the end of Prohibition until 1964. I guess the dogs weren’t aware that they could wind up in Leavenworth for turning the bottle into a toy. I took a walk in the field just to enjoy the tall Indian Grass stalks. During the next few months the dried stalks will disappear as their bases decompose and the dead grass falls to the ground. 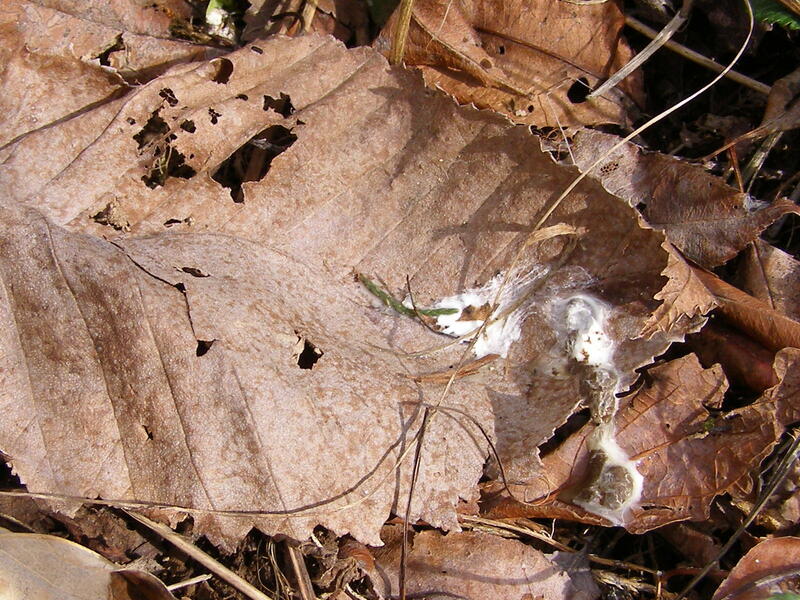 Once they are down, the stalks quickly decompose and provide nutrients for new growth. The transformation from dead growth to living is an unobtrusive process that leaves you wondering where all of that dead material went. 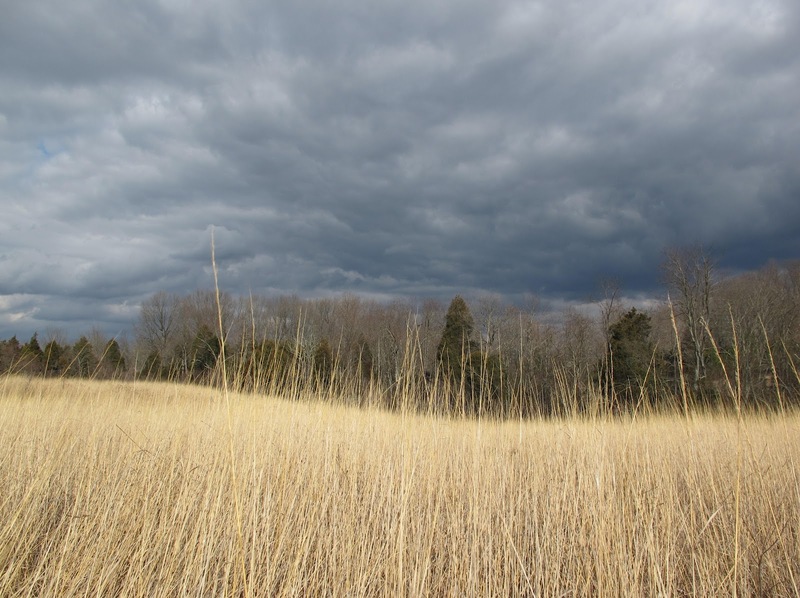 Despite a regular schedule of rain and wind storms, the Indian Grass has remained upright all winter. 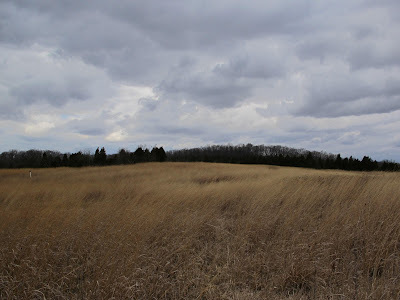 A cold wind, combined with grass talks whipping my face, makes the walk a little less comfortable. That turbulence is just a surface event. Down in the grass, the wind remains calm and the environment is much more comfortable. 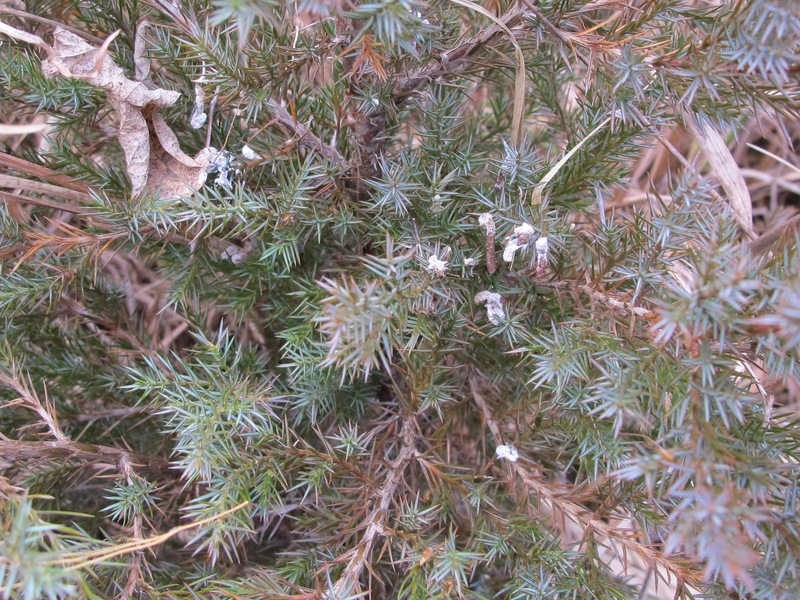 A small cedar hidden in the tall grass has been a roost site for some small bird. The Indian Grass fields always contain a variety of birds. Occasionally they’ll utilize a small shrub as a night time location, but more typically they’ll just find a convenient spot down in the grass. I stopped taking nighttime walks through the Indian Grass long ago. I felt bad about spooking the birds from their overnight roosts. 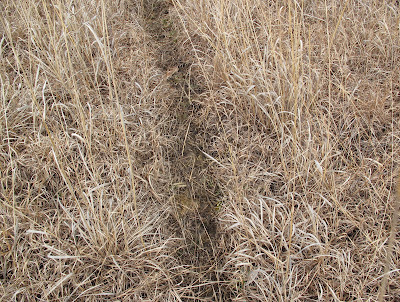 The most obvious sign of wildlife in the Indian Grass is the network of deer trails that criss-cross in all directions. The deer create the trails, but all wandering wildlife species seem to utilize them. Some trails have remained in place for several years, while others are created and abandoned seasonally. They sometimes remind me of a county and township road system. 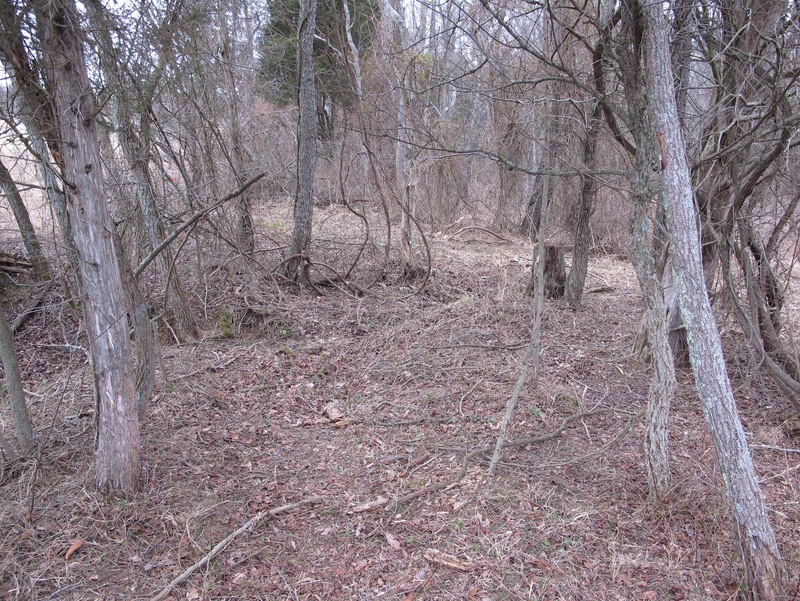 Deer beds are located throughout the field. These beds are located a little distance off the trails. 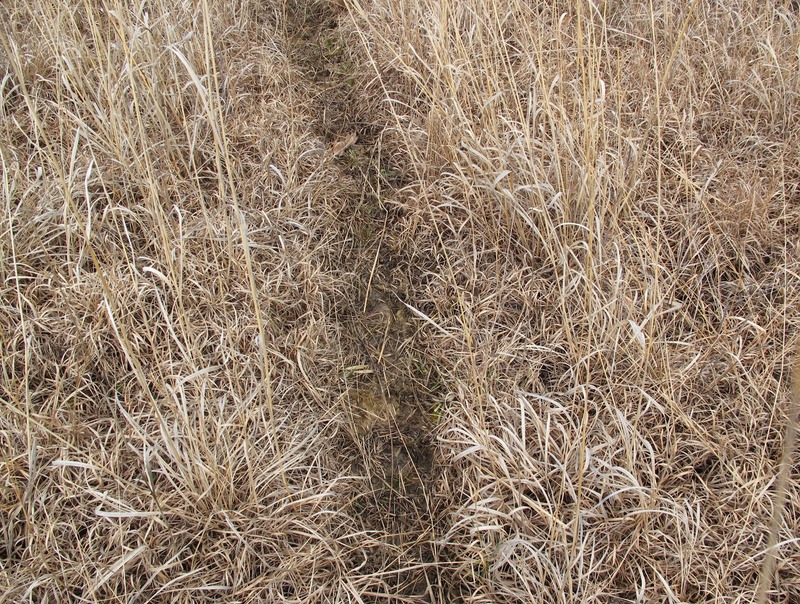 This is likely a strategy to avoid detection by predators that may find the trails to be a convenient way to travel the fields. Most beds are located on the slopes or ridgetops where the ground is more likely to be dry. 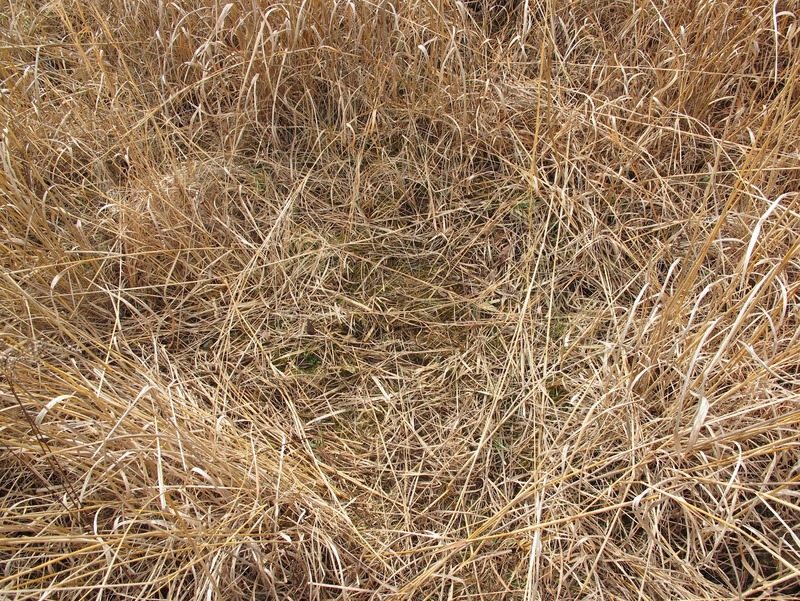 A deer bedded down in the Indian Grass can avoid visual detection, be protected from the wind and benefit by the insulating ability of the grass stalks. 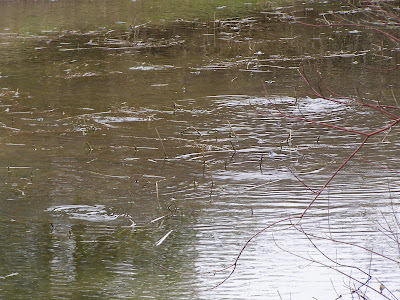 Frequent rains have given members of the mole salamander family many opportunities to migrate to their breeding pools. Most species head for quiet pools where they lay a mass of eggs encased in a jelly-like envelope. 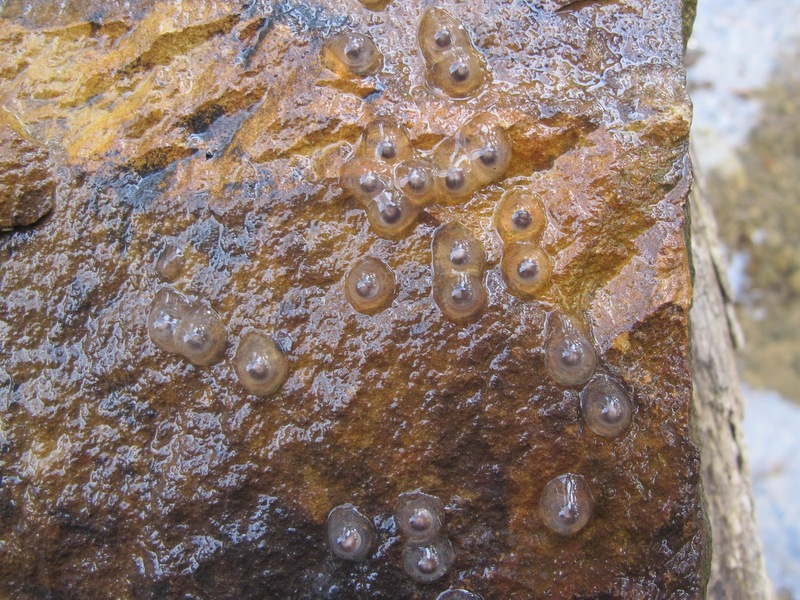 The exception is the Streamside Salamander, a species that utilizes intermittent headwater creeks as a depository for its eggs. Streamside Salamanders anchor their eggs to the underside of flat rocks in the stream channel. 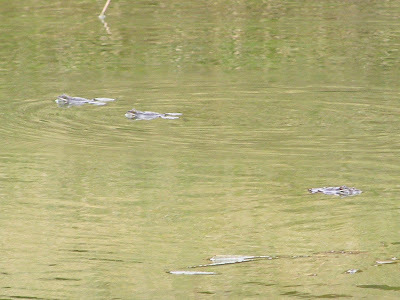 Large, well anchored rocks situated in moving water are ideal as a breeding site. 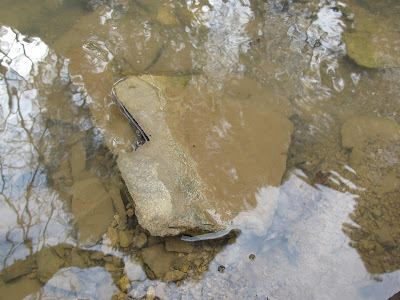 A rock such as this can accommodate several adult salamanders and allow them to perform courtship and egg laying activities completely hidden from the eyes of any aquatic predators. 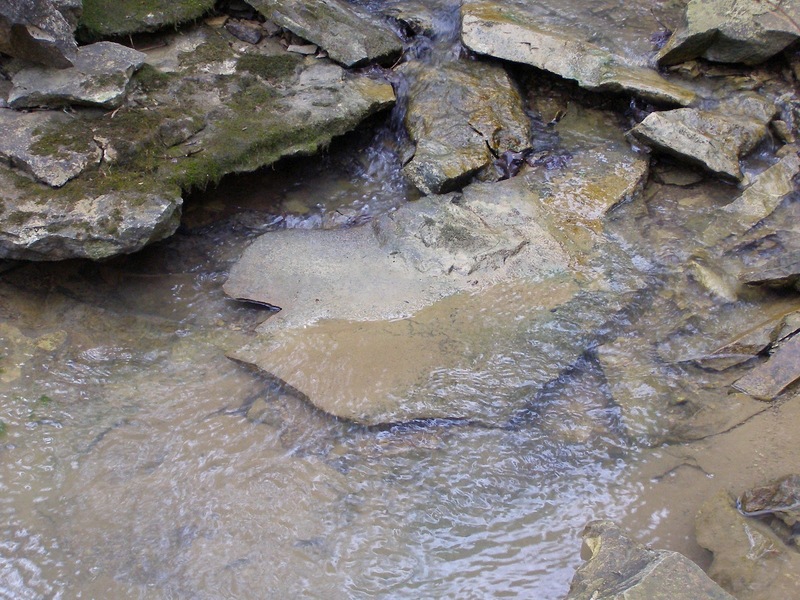 Occasionally, a female will select as a breeding site a smaller rock that could be easily moved by fast moving water or a foraging Raccoon. Eggs laid beneath a rock like this are typically lost, so those inappropriate survival genes are eliminated from the population. This may not be a smart place to lay eggs, but it does give me an opportunity to get some pictures. I never move the large rocks. 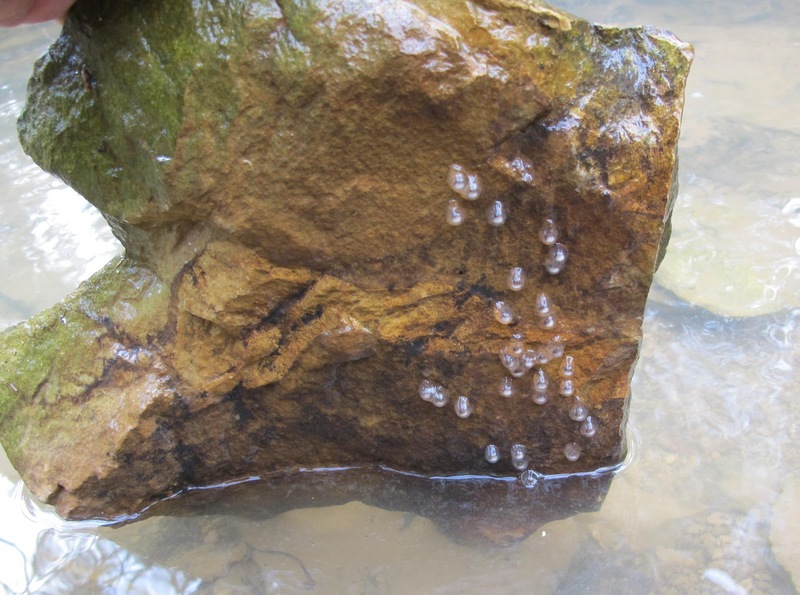 My tampering could easily damage the eggs as well as destabilize the rock’s position in the stream bed. Based on the fact that the pools below the most promising large rocks fill with Streamside Salamander larvae each spring, I think have a pretty good idea of what goes on under those rocks. 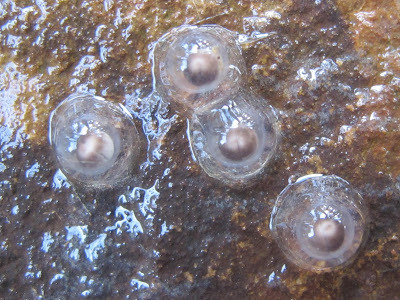 Streamside Salamander eggs are laid individually. Water flowing beneath the rock keeps the eggs clean and well oxygenated. This salamander needs clean, rock bottomed creeks for breeding. 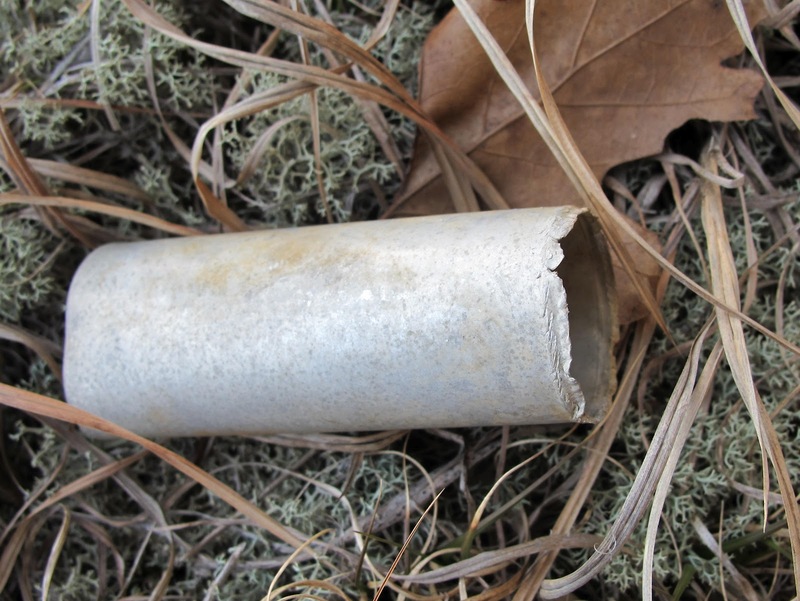 During most of the year, the adults spend their lives below ground in the neighboring forest. 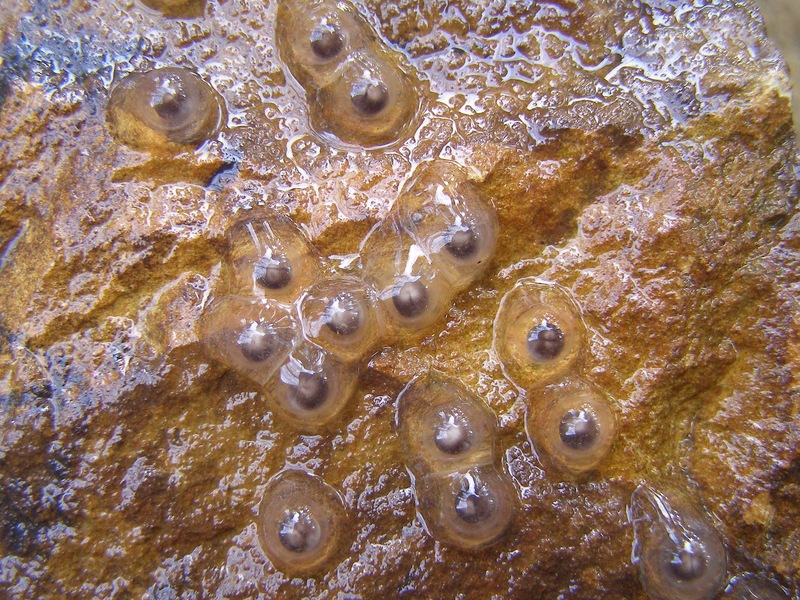 Their appearance is almost identical to that of the Smallmouth Salamander. I was told by one expert that the only way to be sure of a specimen in hand was to do a DNA analysis. 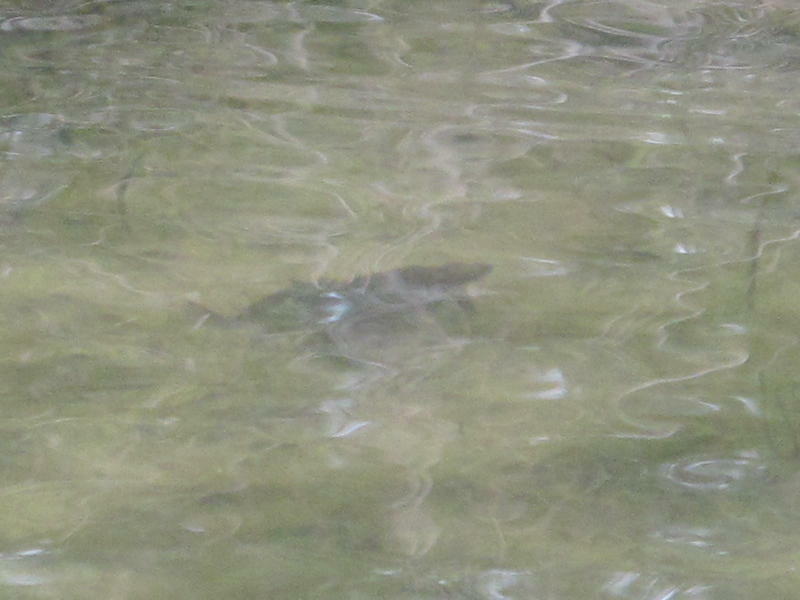 I just assume that those I find in the stream are Streamsides and those in the pond are probably Smallmouths. 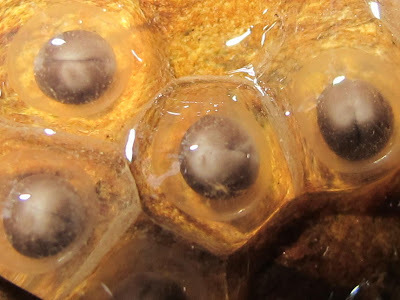 The eggs are just beginning to develop. 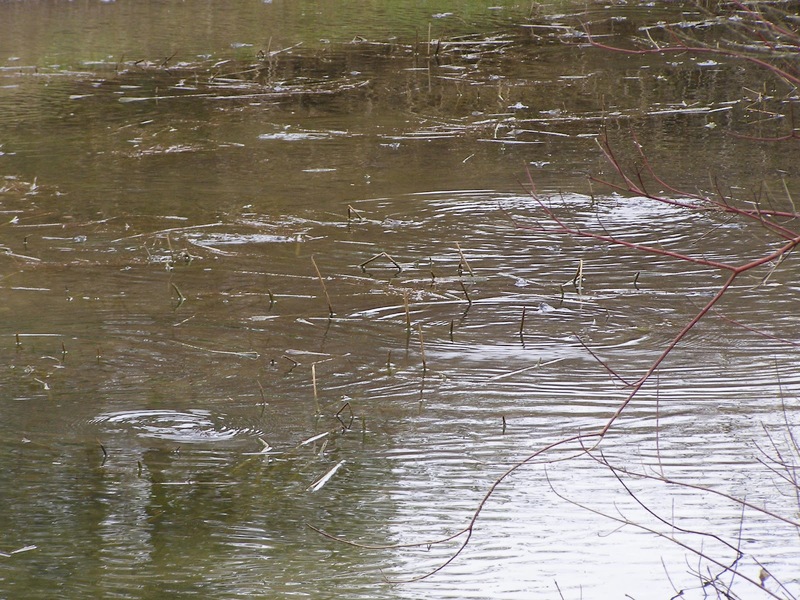 The race is now on to make it through the larva stage before the creek dries up for the summer. 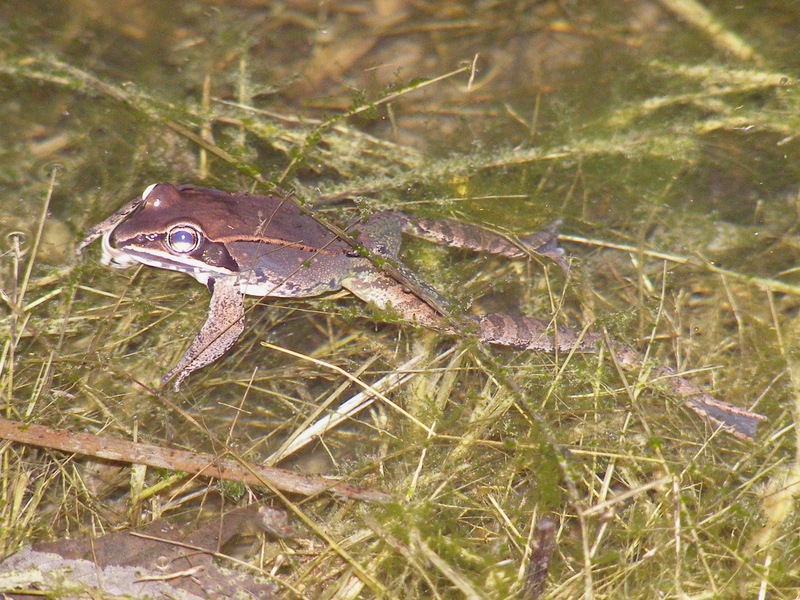 Weather conditions have finally spurred Wood Frogs to congregate in their breeding ponds. They’ve arrived in record numbers at the Blue Jay Barrens pond. 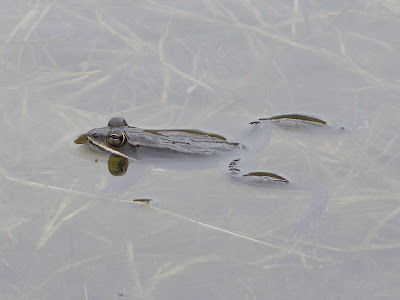 Wood Frogs have only been using this pond for about the last ten years and there were a couple years during that time that I didn’t hear or see any Wood Frogs at all. Their numbers have grown steadily over the last three years. 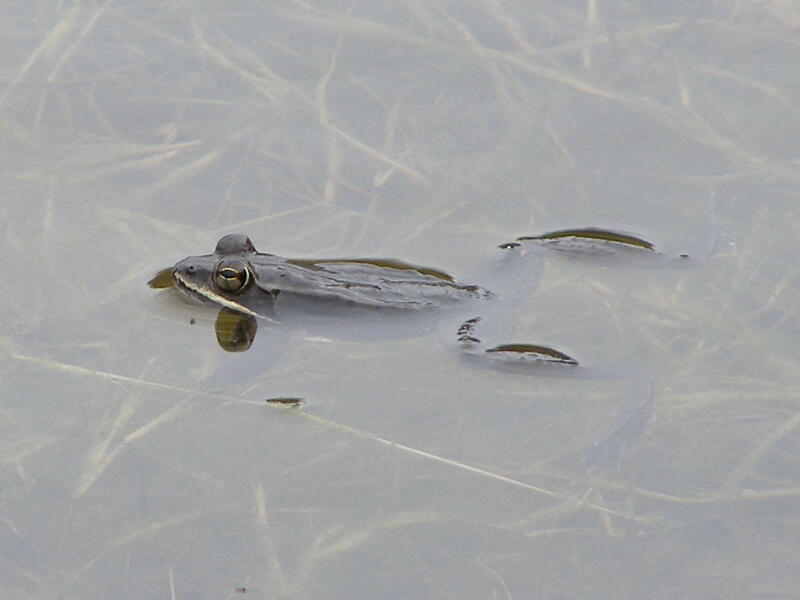 This is the first year that there has been noticeable breeding activity during the day. 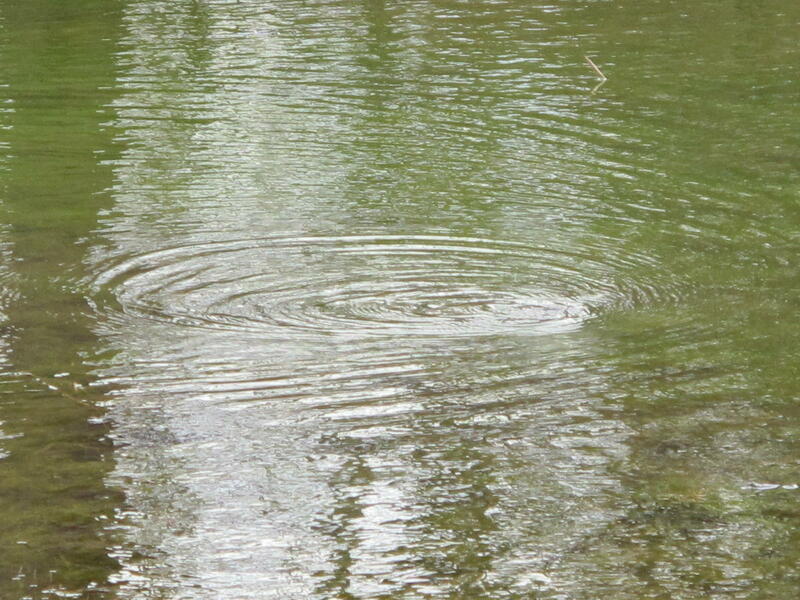 The frogs maintained a constant flow of ripples across the pond surface. 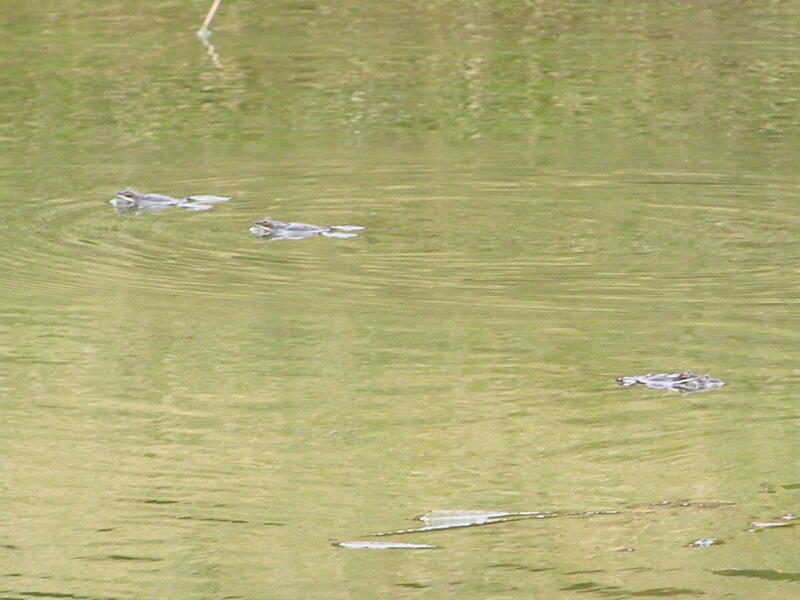 Males floated about watching for a passing female. Sight of a prospective mate led to a chase. In most cases, the pair plunged beneath the water at the moment of contact. 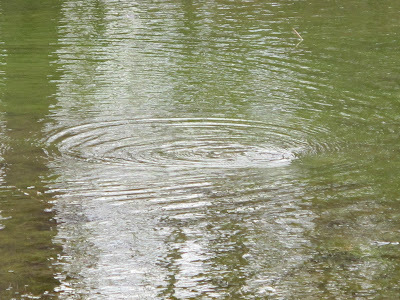 The sound and splash reminded me of a bass feeding on the surface. 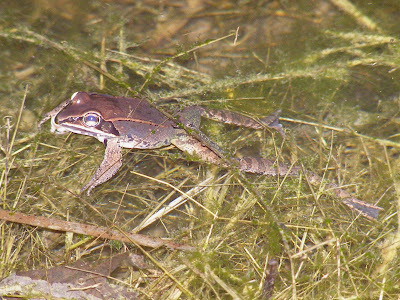 The joined couple would then head down to the pond bottom to prepare for egg laying. This is the anticipated outcome. 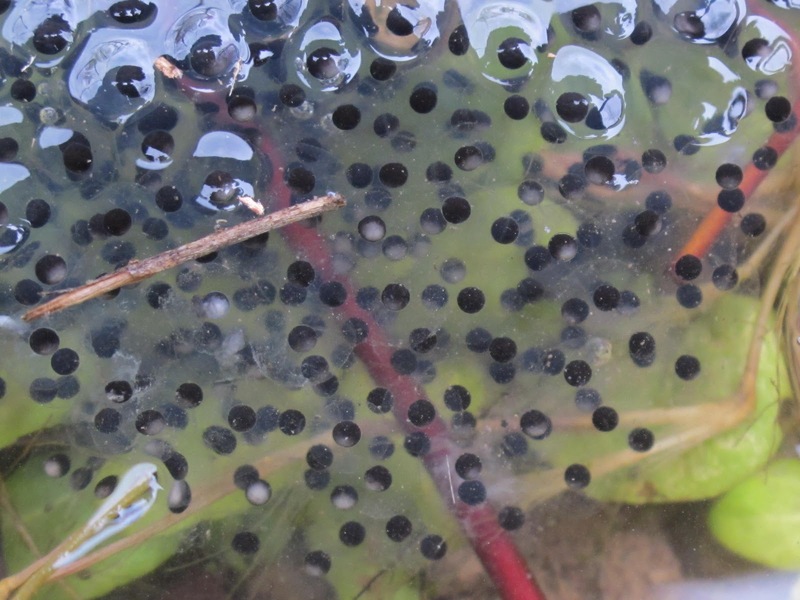 I’m hoping the pond will be full of these egg masses in a few days. 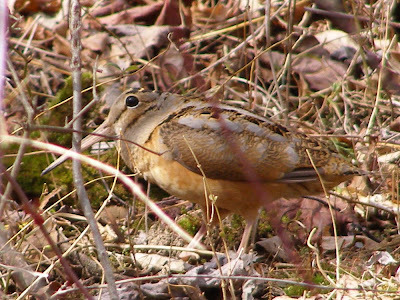 Woodcock are beginning to make their way back to the Blue Jay Barrens breeding grounds. Several have already joined the odd male that has been displaying since November. It’s not unusual to see Woodcock, but it is uncommon to get a recognizable photograph. 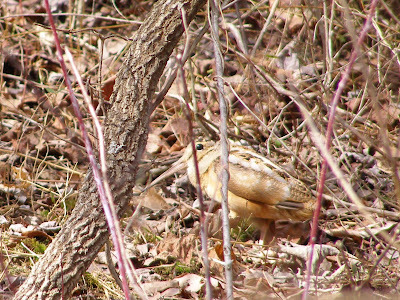 I’ve flushed several Woodcock in the last couple of weeks, but they usually move quite a distance before settling back down. 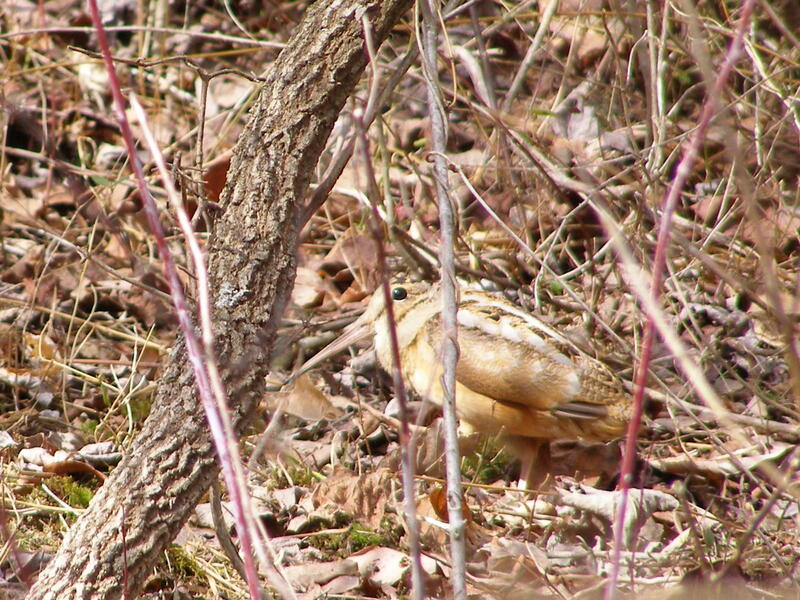 This bird took a short hop of about 30 feet and then tried to sneak away through the underbrush. Woodcock take full advantage of the browns and grays of the late winter landscape. When at rest, it can be both in full view and nearly invisible. Its retreat was in the form of a slow walk. As it moved along, the body swayed rhythmically forward and back. I just stood and watched as it made its escape. 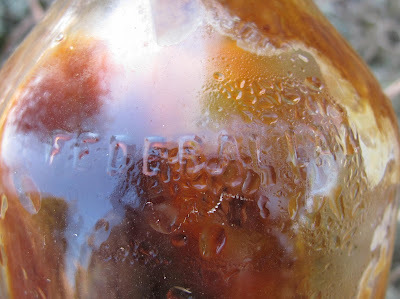 The bird flushed when I walked over to retrieve this glass bottle I had seen sparkling in the sunlight. If the Woodcock had stayed put I’d like to think I would have seen it before grabbing the bottle. Their camouflage is so good that I could easily have picked up the bottle and not noticed the bird. 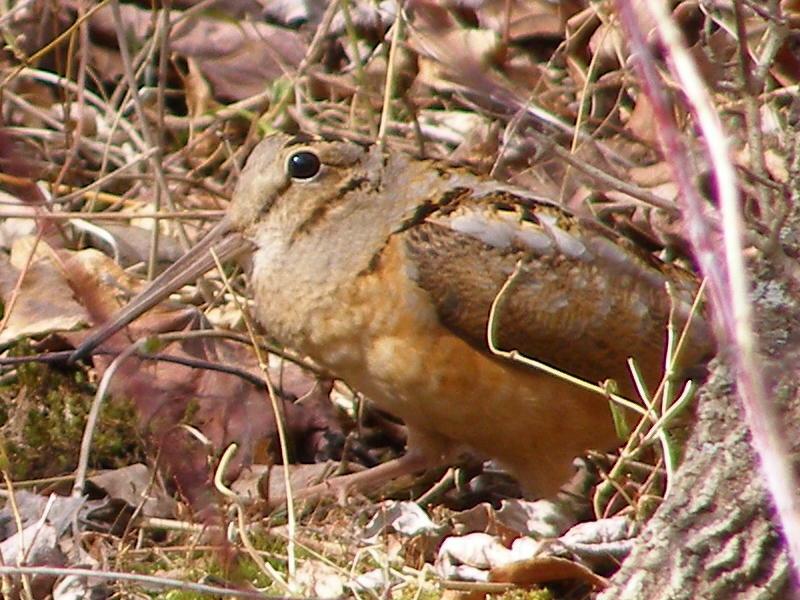 When I flush a Woodcock, I always check to see if it might have come off a nest. 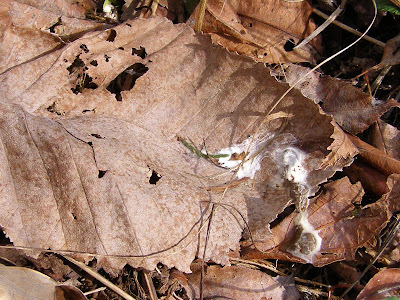 So far this year each resting site has had a fresh dropping left by the departing bird. Mid March is the earliest I’ve ever found a nest with eggs. So as to not endanger any Woodcock nests, I always stop my clearing and mowing projects by the end of February. That just gives me a few more days to wrap up my current activities. When you’re used to walking through an area of dark barked trees, a patch of white on the tree trunk is highly noticeable. 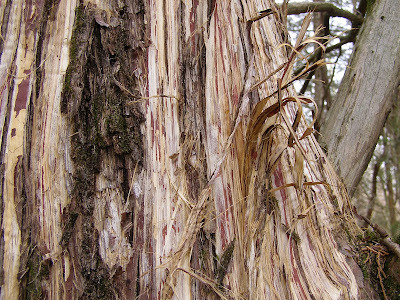 Something has obviously been stripping the bark from this cedar. 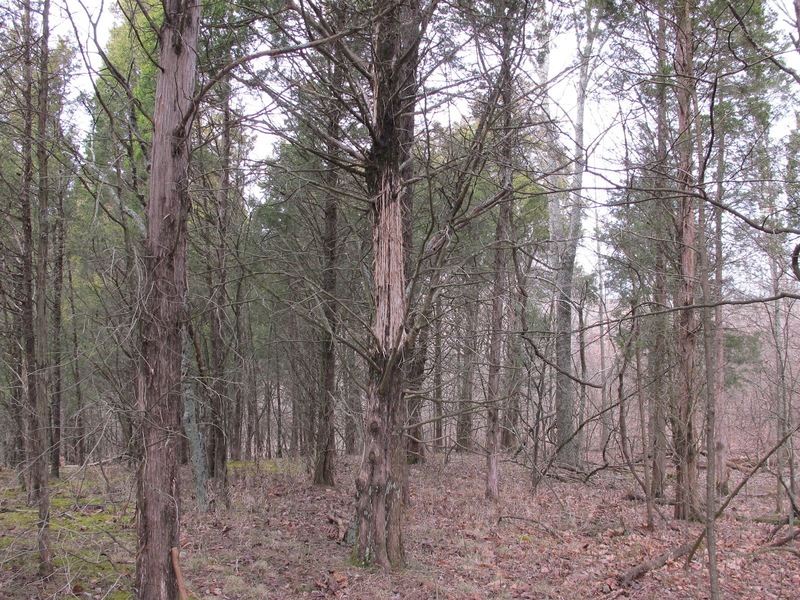 The challenge is to find the reason for the missing bark. It’s not unusual for large cedars to shed long strips of outer bark. 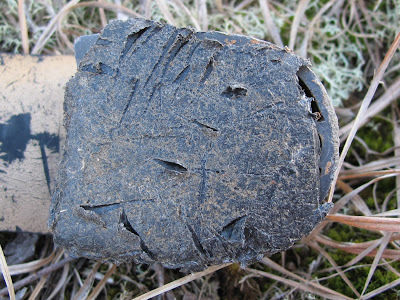 When this happens naturally, the exposed surface is normally a grayish color. When yellows and reds show through, it means that some animal has been forcibly removing the bark. 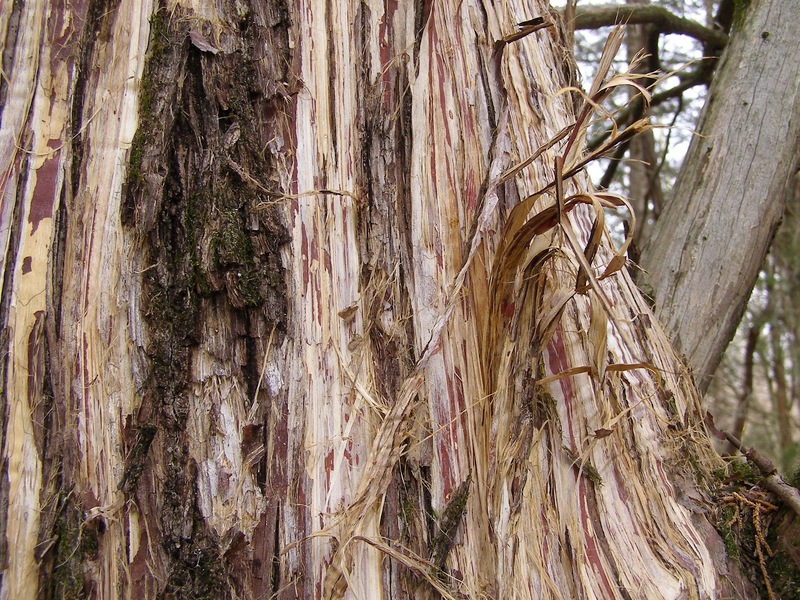 A variety of birds and mammals use cedar bark strips as nesting material. The number of strips taken from this tree would make a pretty bulky nest. 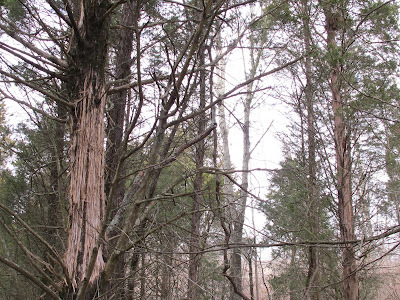 I began searching the surrounding tree tops for nests. I found a couple of old squirrel nests before I spotted this new construction about 40 feet up in a neighboring cedar. 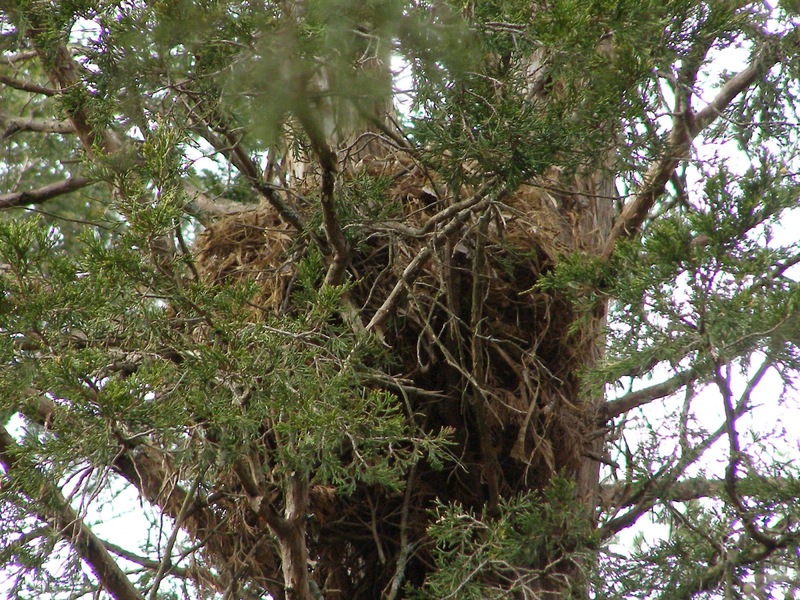 The nest is tucked up close to the tree trunk and is supported by several stout branches. 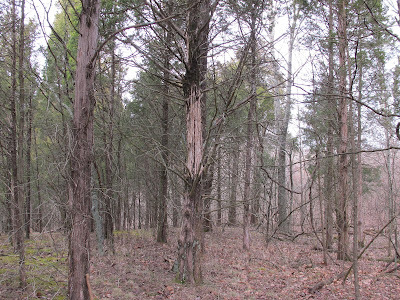 There are some old cedar branches and miscellaneous other twigs topped by a mass of fresh cedar bark. 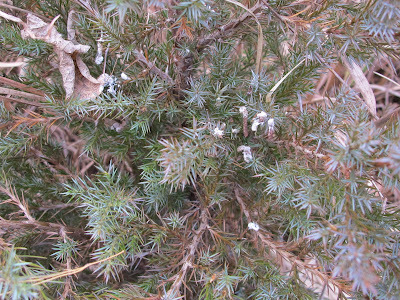 The nest tree is not far from the collection site. 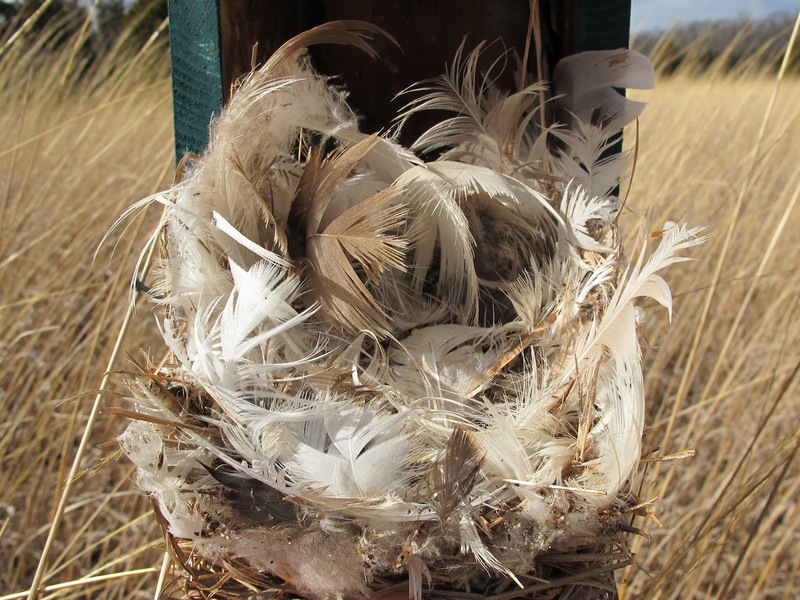 Based on my experience of nests built in this fashion, I would guess the builder to be either a Gray Squirrel or a Cooper’s Hawk. Squirrels mate in late winter, so young could be expected in late February or early March. This could be the beginning of a nest to be used for a new litter of squirrels. I searched the ground route as well as all possible aerial routes that might be taken by a squirrel transporting nest material. 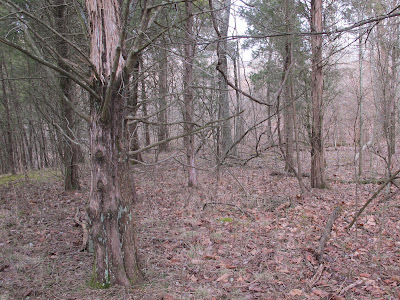 I figured that if it was a squirrel carrying the bark, a few scraps should be evident somewhere between the two trees. I found nothing. The nest is too flat topped and thin to be that of a squirrel, unless there’s going to be additional material added. I’ve seen Cooper’s Hawks nesting on structures like this, but I’m not sure if they did the building or if they just built on top of an old squirrel nest. 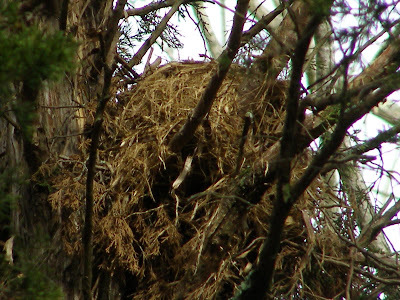 It also fits the description of a Crow’s nest, but I’ve never seen a Crow nesting at Blue Jay Barrens. I guess I’ll have to watch and see what develops. 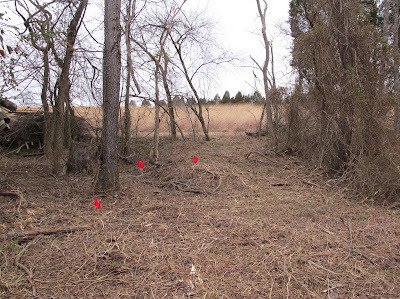 I’m getting near the end of my fence row clearing project. 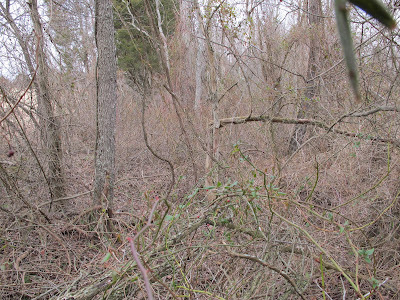 I’ve moved into an area about 100 feet long that is a tangle of fallen trees, rough ground, Multiflora Rose bushes and Japanese Honeysuckle vines. As I worked my way to this point, I was hoping that I would discover a way to make this job a little bit easier. Unfortunately, I was struck by no such brilliance. 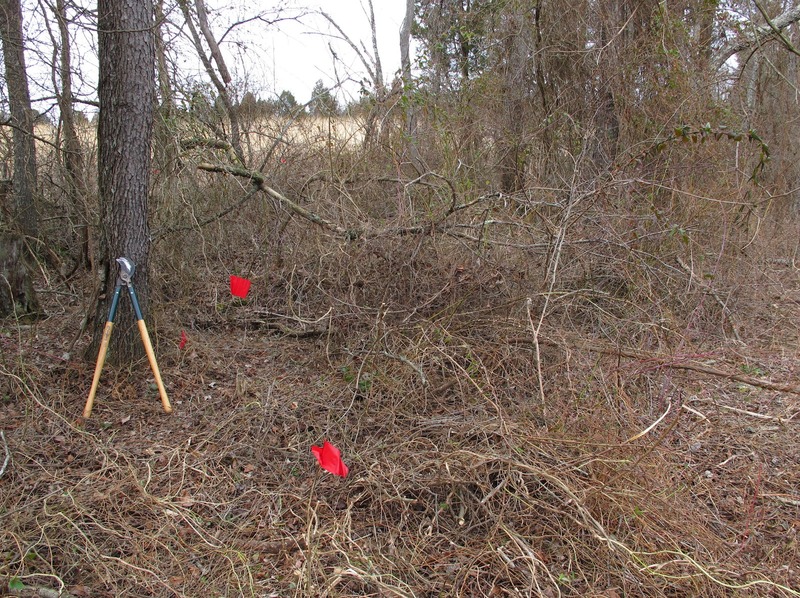 The number of rose bushes was not great, but the density of canes was daunting. 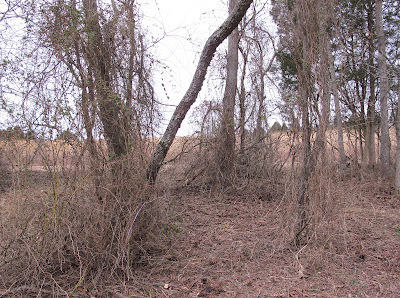 Vertical canes rose 25 feet into the trees and 20 foot horizontal canes wove together with neighboring bushes to form an almost solid mass. The whole arrangement was like one of those ecosystem web diagrams. 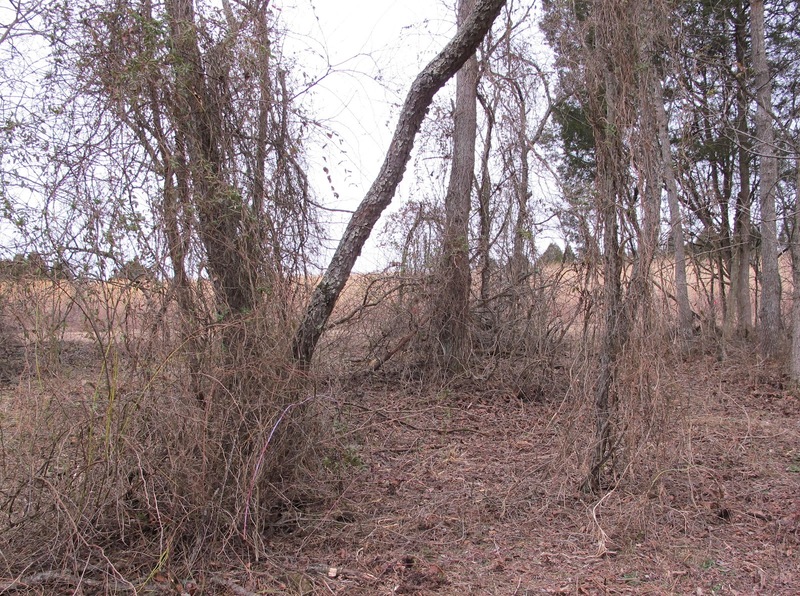 Pulling on a single cane caused the whole thicket to respond. I think I got snagged by rose thorns every time I moved. There was no way to get the mower in there, so I waded in with Big Loppers and started taking out one bush at a time. Each extraction was a tug of war with the Japanese Honeysuckle. After pulling a few bushes free, I would take JR in to cut the honeysuckle down close to the ground. I take a lot of before and after photos, but those don’t always convey the degree of difficulty experienced in getting from one condition to the other. I think I was constantly tangled in rose canes the entire time I spent working in this one small area. If I’d lost any more blood to rose scratches, it probably would have been necessary to stop for a transfusion. 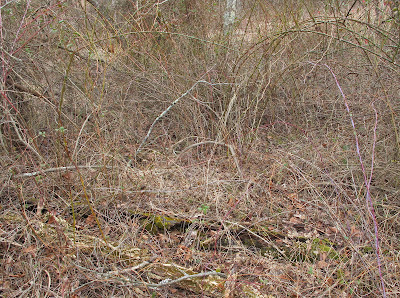 Several pounds of mulched honeysuckle vines were left on the ground. 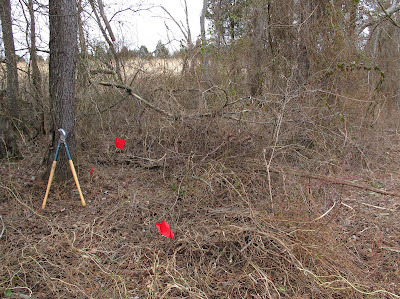 In order to have a chance at eliminating the Japanese Honeysuckle, I’ve got to get it out of the trees and on to the ground. 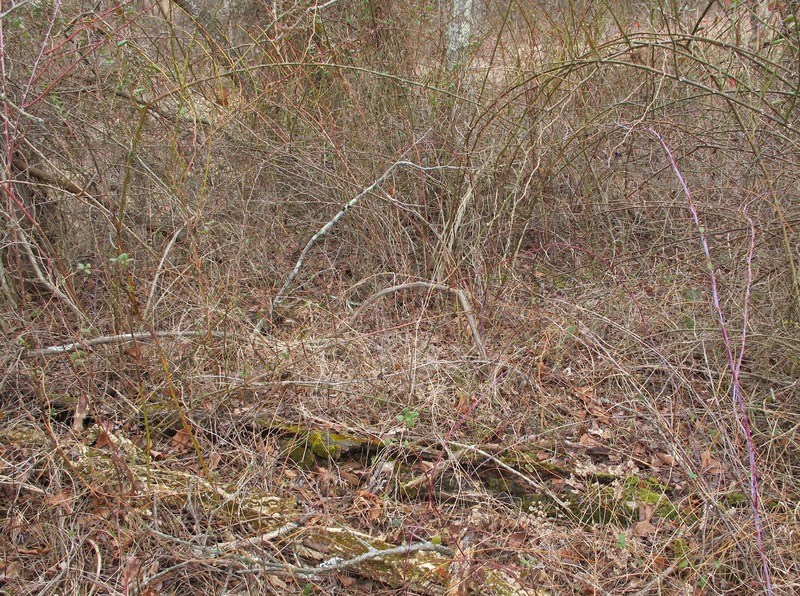 By spraying glyphosate herbicide in late fall when just about everything except the honeysuckle is dormant, I’ve been able to completely eliminate Japanese Honeysuckle and leave the native plants. So far, I’ve only done this on small plots. In the next year or so I’ll begin to try it out on larger areas. In a few places, I cut the honeysuckle off at the ground, but couldn’t get the vines to come out of the tree. After the vines dry, they’ll more easily come loose. If I can’t get them down in the next couple of weeks, I’ll cut them off as high as I can reach. 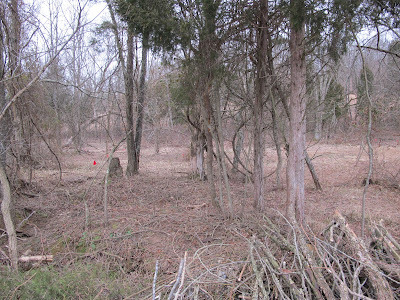 That way I’ll be able to see any invasives growing up around the base of the trees when I go out to spray sprouts this spring. This fence row segment now opens into last year’s Multiflora Rose control area. I think I’m going to be happy with the results of this project. I’ve begun to check the bird boxes to make sure they’re in shape to satisfy any birds that are ready to begin nest construction. Wet weather and strong west winds have left this box with a little lean to the east. The birds won’t mind a slightly uneven floor. The last 2011 tenants were a pair of Tree Swallows that managed to successfully fledge six youngsters. All Tree Swallows line the nest with a few feathers, but this pair has set a Blue Jay Barrens record for the number of feathers in a single nest. 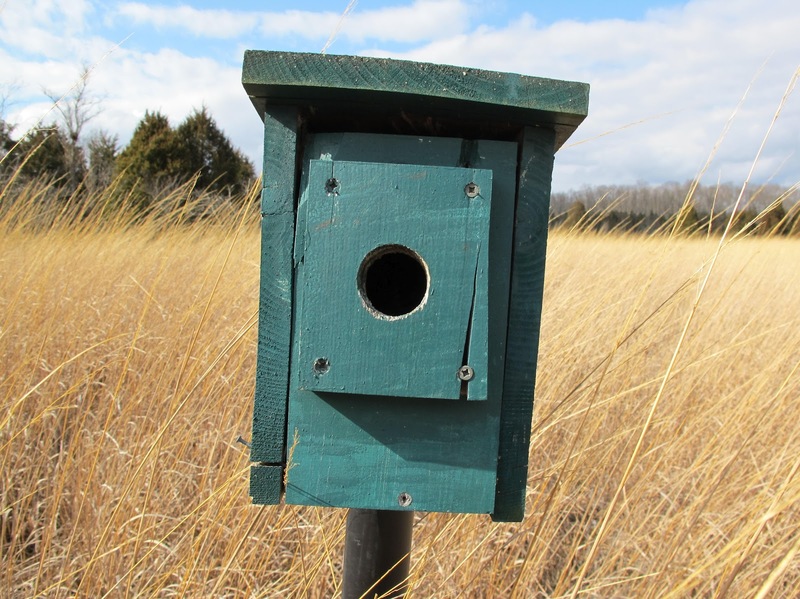 Many of the boxes are used as winter roosts by the Bluebirds. 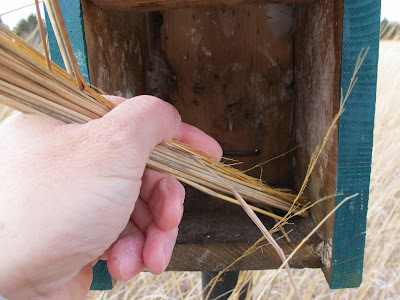 Sometimes they choose a box containing an old nest, so I always leave a couple of boxes with nests through the winter. Since there were no signs that this box was being used as a roost, I cleaned out the nest material and brushed out the dust with a homemade Indian Grass brush. 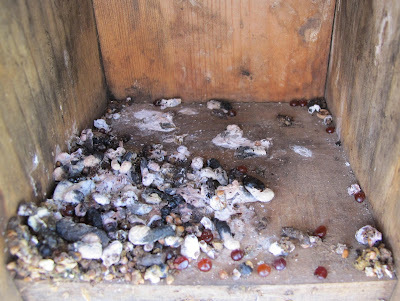 This box was cleaned out in the fall and has been used all winter by roosting Bluebirds. 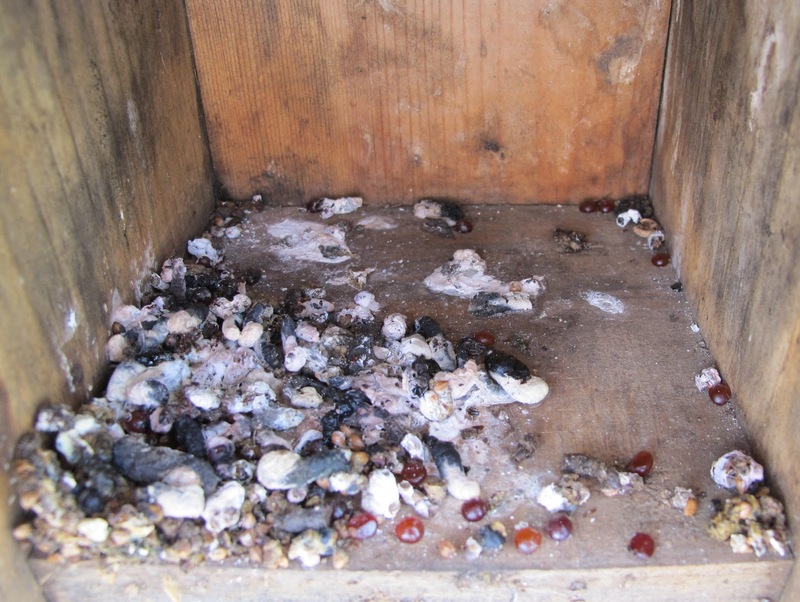 I clean the droppings out every few weeks, so it’s easy to confirm that the box is still being used. Bluebirds consume a lot of fruit over the winter, so their droppings are full of seeds. 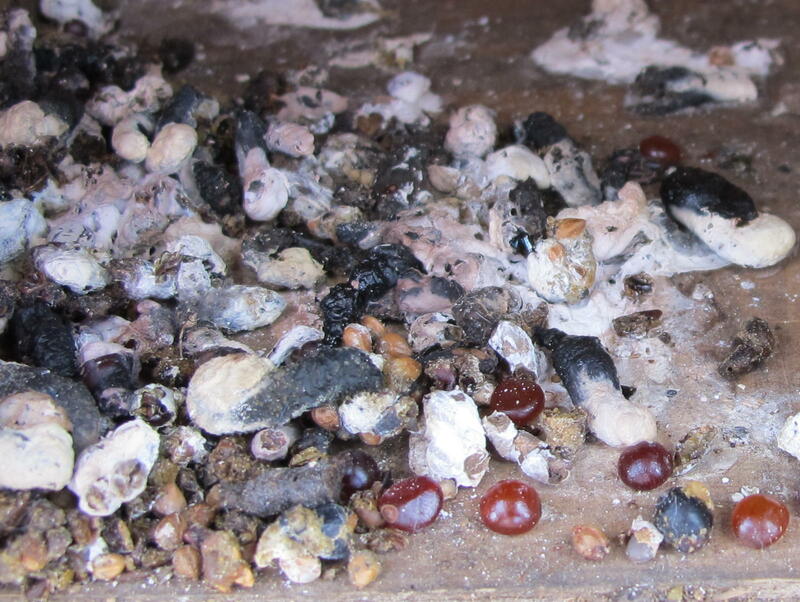 Seed coats were softened by the bird’s digestive juices, making the seeds ready to germinate. 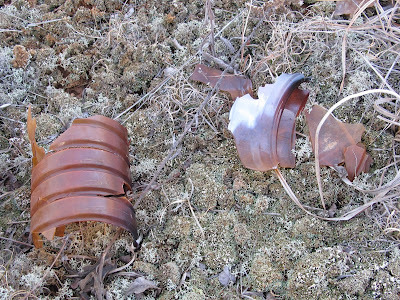 This is part of the reason so many shrubs grow up around the boxes. By germinating the seeds in pots, I’ve discovered that the birds feed heavily on Eastern Red Cedar, Wild Grapes, Poison Ivy, Japanese Honeysuckle, Autumn Olive, Multiflora Rose and Bush Honeysuckle. I see a lot of those species represented in this mess. Besides the familiar seeds, there are a few that I don’t recognize. I think I’ll go ahead and pot these up and see what develops. It may be a good idea to do this every year. If there is a new invasive plant moving into the area, I bet the birds will find it before I do. 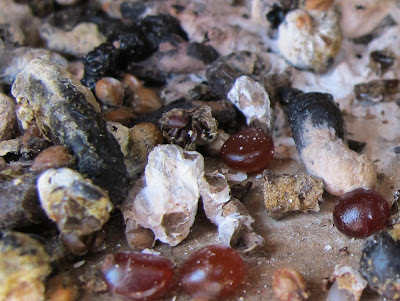 Germinating the seeds may act as an early warning system of invasion by a new exotic species.